Phone Power DVD by George Walther – Free Video Clip – Discount! Get ready for a content-loaded seminar will give you specific ideas on how to use the phone to your greatest advantage. Whether your a sales person, business professional, or customer service representative, you’ll learn and quickly benefit from these proven, practical ideas for getting through to the most important people on your list. 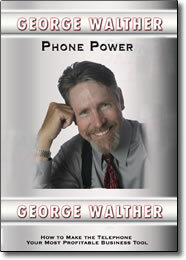 George Walther is an internationally acclaimed expert at boosting telephone effectiveness. He’s a professional speaker of the highest caliber with an energetic style that captivates, motivates and teaches people how to be more productive and professional. With 25 plus years of research, development, and experience in the communications arena, George knows what he’s talking about.